Encounters between Service teams are usually tough, gritty affairs. Very often, they are too close to call. Today’s one at Welisara between the Navy and the Army could see an continuation of that trend. Pre-season, the Navy was hit by desertions. Incisive Centre Lee Keegal and influential forwards Sajith Saranga and Sathya Ranatunga ‘jumped ship’. Coach Mothilal Jayatileka has been able to rope in experienced players such as Mohamed Abzal and Mushin Faleel for the Back division. There is fresh blood infused into the pack with the entry of Isipathana’s Adeesha Weeratunga. The Navy Back division has plenty of speed, with speedster Buddhima Piyaratne on one Wing, and Supun Dilshan on the other. It all comes down to how the newly stitched-together Line works. Richie Dharmapala, brother of the more celebrated Richard, pairs off with Abzal as the Halves combination. The Pack will comprise of last year’s players, in the main. They have loads of experience in the form of this year’s skipper Danushka Perera and last year’s one Dulanjana Wijesinghe. But the player who could make the difference is talented Full-back Thilina Weerasinghe. He had a ball last season, accumulating more than 100 points with his kicks at goal. The Army team, which you underestimated at your peril, will be led by Winger Thusitha Senanayake. The Back division will have most of last year’s players, with Maduranga and Sanjeeva Hapugaskumbura as Centres and Sudaraka Dikkumbura manning the Wing. The latter, who is prepared to run from almost anywhere, has the ability to find gaps with his stop-start runs. Ashan Bandara hit it off well with his Scrumhalf Mohamed Rizvi, and the pair should continue to open up the game. Army’s strength lies in their Pack. 2015 skipper Asoka Jayalal and his successor in 2016 Manoj Silva are 2 players who like to crash through, come hell or high water. There’s also flanker Chandima Abeyratne who has been an asset to them. Imanka Ariyapala, who provided some thrust in the Back division has changed clubs. But this will not deter new coach Nilfer Ibrahim, who is particularly keen on the run-and-pass game. CR&FC, who take on the Air Force at the latter’s home base, should pull this one off. The Longdon Place Club has acquired the services of 2 outstanding Isipathana players in Harith Bandara and Chamod Fernando. Sudeera Gayanath is also from the same stable. There has been an exodus of sorts from the Police. Udara Gayan, Joel Perera and, importantly, Reeza Rafaideen have thrown in their lot with CR&FC. In addition, Ashen Fernando continues the Royal-CR link. On top of all this, CR has the talented duo of skipper Kavindu Perera and Janinda Ratwatte. One suspects that CR’s Back division will be seen in action quite a bit, with the players in their ranks. That outstanding former Isipathana No.8, Omalka Gunaratne, should continue to take on all-comers with his daredevil style of play. 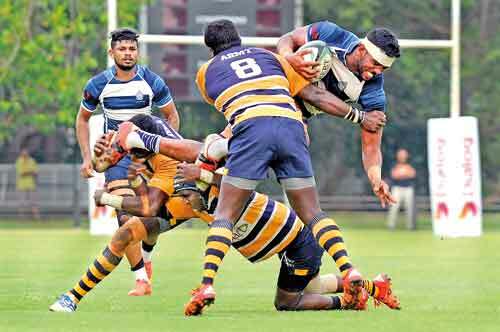 Last season, Air Force were the talk of the local Rugby scene, when they stunned champions Kandy SC. Sadly, they lost momentum sometime thereafter. This season they enter the field with confidence undimmed. New coach Ronnie Ibrahim is experienced and is sure to produce a competent team. Skippering the Light Blues will be the Back Pushpakumara Samarahewa. He will be expecting some of those who did well last year to continue in the same vein. Fly-half Gayantha Iddamalgoda, a very hands-on player, had a particularly good season in 2016. Charith Seneviratne, a very experienced Centre, could be the key to his team’s fortunes. The Airmen are happy that another Seneviratne — Radeesha — has come back to base after a brief sojourn with the Police team. The Air Force can fall back on the expertise provided by seniors such as Ramesh Ramdas, Ranil Medagedera, Tharaka Werella and Dinesh Weeraratne. The latest acquisition by the Air Force is that of St. Anthony’s Centre Jehan Seelagama, who played impressively for his school.